Studies have shown that around 30% of couples who are attending couples therapy are what therapists call “mixed agenda couples”, or a couple who is unsure whether or not they want to stay together. One partner may be interested in fixing or maintaining the relationship while the other partner may be ready to leave the relationship. Research also shows that even after entering legal processes, about 30% of individual parents of minor children are interested in maintaining the marriage and reconciling. These studies are telling us that there is a need for a therapy model for these mixed agenda couples, especially since many of them are entering the process of divorce without serious attempts at reconciliation. A new therapy model that addresses mixed agenda couples is called discernment counseling. The goal of discernment counseling is for the couple to have greater clarity and confidence in their decision about the future of their marriage or relationship, whether it is reconciliation or separation. Often times when issues arise in a marriage, the couple tries to deal with them as a couple or issues are avoided and ignored. When issues become much larger or no longer manageable, one partner or both may decide that the relationship is no longer salvageable, and it must be time to divorce. They may see no other options. Unfortunately, many couples are unaware of discernment therapy and its benefits, and will begin the divorce process before trying to work on the relationship. 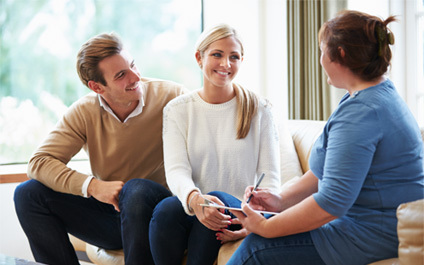 A major benefit of discernment counseling is that it allows the couple a space to talk openly about the issues before committing to couples therapy or ending the relationship. Couples therapy implies that there are goals that the couple is trying to achieve, usually in hopes of improving the relationship. It is very difficult, if not impossible, to do effective couples counseling when one partner is already one foot out the door. Discernment counseling’s goal is to gain clarity on what is best for the couple and have a space to discuss why divorce is on the table. Discernment counseling focuses on the couple deciding on one of three paths: (1) the marriage continues as it has been, (2) separation/divorce, or (3) a six-month reconciliation period with a committed effort in therapy with divorce off the table (and then make a decision about the future of the relationship). Discernment counseling allows the couple to decide which path they would like to go down in an open and respectful manner, which is extremely difficult to navigate on your own. Discernment counseling is beneficial not only for couples who decide to take path three and work on the relationship, but also for couples who decide that too much damage has been done in the relationship and it is time to move on. Discernment counseling allows the couple to make a decision together what is the best outcome for their future as well as have a space to understand each other’s perspectives of how they landed in this situation in to begin with. Even if the couple does decide to separate or divorce, this process allows a space of respect, openness, and curiosity. It may be more likely that the ending of the relationship will be on better terms and both parties may have a deeper sense of understanding and closure as opposed to jumping to divorce as the first step. Having a relationship end on respectful terms will be beneficial for each individual in future relationships as well as with issues that may arise with co-parenting. Discernment counseling opens a space for a couple to talk about the difficult issues that led one or both of them to see divorce as a real option. While discernment counseling may not necessarily prevent divorces from occurring, it can teach couples how to communicate about their relationship and their grievances in a healthier and more effective manner. If you are unsure if you and your partner’s relationship can or should continue, discernment counseling may be a good option for you. Contact Symmetry Counseling if you are interested in learning more about discernment counseling or if you are interested in setting up an appointment with a therapist who works with mixed-agenda couples.